Java 6 is finally available for OS X 10.5 running on Intel 64 bit hardware. Please do not set it as the default virtual machine or you will break Cyberduck. Reported at the Apple Bug Reporter as bug radar://5901349. Update: Cyberduck 3.0b3 is available and resolves this issue by setting explicitly Java 5 as the required Java VM. In Mail.app, you can open Window → Activity (Command-0) to show all pending networking activities. Cyberduck 3 now includes the same functionality. It gives you a better idea how much longer the progress bar will still be spinning and allows you to stop pending background tasks. Prevously, this was only possible for the currently running task using the Stop toolbar button in the browser window. Check this out in the the latest nightly build. Mac OS X 10.4 or later required. 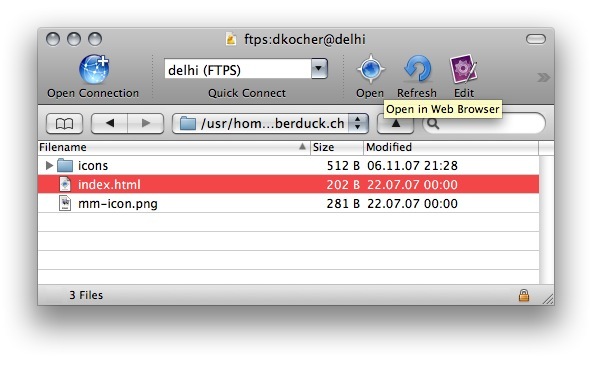 As already noted by macapper.com, the just released Beta 2 of Cyberduck 3 adds the feature to open the corresponding web address of a file selected in Cyberduck with your default web browser. For this feature to work, you have to specify a reasonable default path in your bookmark (e.g. /home/dkocher/public_html/) which must be the directory accessed by the web server as your document root. Using an Apache webserver, this is the DocumentRoot directive. Also in the bookmark setting, you can edit the Web URL which allows you to enter the HTTP URL of the webserver using a different hostname. From time to time, someone opens a ticket in the Cyberduck Bug Tracker, requesting that a sound should be played once a download or upload is complete. I always close these tickets with a wontfix/worksforme resolution. The workaround is to download Growl. After installation, restart Cyberduck and open the Growl Preference Pane in the System Preferences. Navigate to Applications → Cyberduck → Configure… → Notifications → Select a notification (e.g. Download) → Choose Play Sound…. Then pump up the volume of your speakers and transfer some files with Cyberduck. 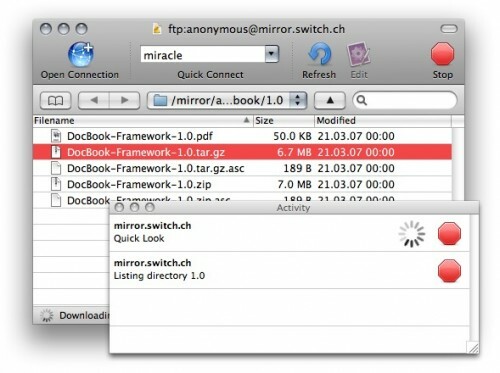 Cyberduck 3 will feature Quick Look, as known in the Finder.app since Mac OS X 10.5. You can toggle Quick Look in a Cyberduck browser for any file using Command-Space Bar. A preview is rendered depending on a Quick Look Plugin available on your system for the given file type. Many file types like different image formats can be previewed with the bundled plugins in OS X and HTML is even rendered in the Quick Look preview panel.